way(s) to cure a broken heart. | escaped. way(s) to cure a broken heart. I fell in love with House Of Harlow 1960 ever since I fell in love with Nicole Richie. Who wouldn't love her, anyway. She's pretty, she's skinny and petite, she has a great line, a super cute baby daughter and a son, and a super cool husband who would never cheat on her. (I don't know really..but still they made it till today) So basically she's my role model. I'm a bangles-and-rings person, so I paid more attention to them. 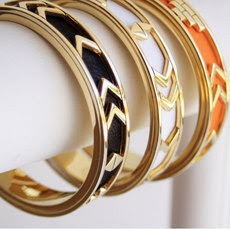 The necklaces are nice too, but I know I wouldn't wear them anywhere so I go for the bangles instead. I do like her Black Resin necklace, though. Very classy.